The legend of Robin Hood is a story constantly rewritten as new films and television shows add to the narrative but the basic details about the once-rich nobleman who robs from the rich to give to the poor remain the same – Robin of Sherwood is an online slot from Rabcat with some good looks and plenty of free spins so keep reading to find out more. Robin of Sherwood is a five reel slot with three rows and two hundred and forty three ways to win; the symbols spin on wooden boxes which are stacked up at the edge of the forest with a castle visible in the background. There’s a clear blue sky as of course there always is in Nottinghamshire. The high value symbols are all characters from the story and include Robin, the dastardly Sheriff of Nottingham, Maid Marion, Little John and Friar Tuck; J, Q, K and A on royal standards represent the lower values. The arrows are wild and will substitute for all other symbols to help form winning combos except for the target scatter icons. This can occur randomly during the base game or free spins and all royal symbols (J, Q, K and A) on one or more reels will turn wild. This is triggered by landing three or more of the target scatter symbols anywhere in view and you’ll receive ten free spins which unfortunately can’t be retriggered during this round. Royal Clearing occurs during the free spins and on every second spin the lowest value card will be removed from the reels so by the end J, Q, K and A are all gone, making it easier to land bigger wins. All wins can be gambled by pressing the ‘Gamble’ button below the reels and here you can double your money by selecting either the green or red target for Robin to hit; you have a maximum of five successive wins but a wrong guess will lose it all. 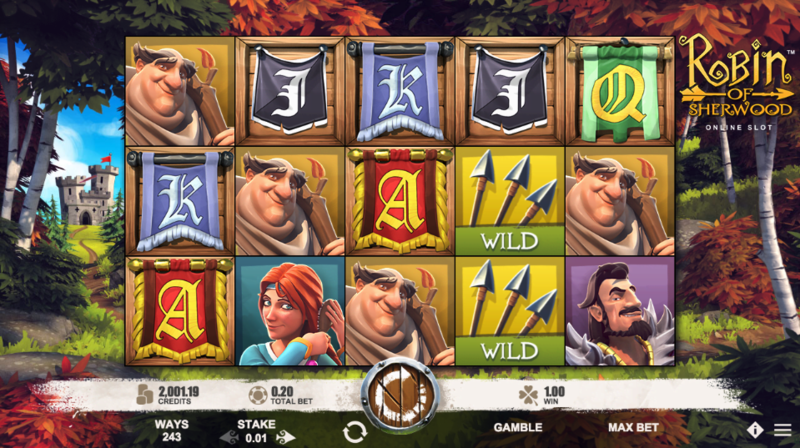 There’s a certain crisp quality to Rabcat slots and Robin of Sherwood maintains that high standard; it may not have the in-depth gameplay of Castle Builder but this is a more traditional game with a popular narrative and some good old free spins. It comes with an RTP of 95.86%.